Twin Spica | Manga Reviews ~ Ramblings of A Fob. I finally got into reading Twin Spica. I first read bits of the first chapter at Barnes & Noble months ago and liked it alot! Asumi is a teenage girl who dreams of becoming an astronaut. She took a test to get into a space program without her dad’s consent. When Asumi’s dad found a letter from the space school, he got mad and unintentionally hit her. That scene captures how one parent might react seeing their child grew before their eyes. Right off the bat, I was won over by how heartfelt Twin Spica started. I symphatized with Asumi’s dad for feeling upset with her decision. Since they only got each other, her dad wanted her to tell him every bits of her plans. Afterwards, her dad quickly came in terms with Asumi’s decision and let her pursue her dreams, even though he didn’t have enough savings for it. On the way to Tokyo Space School, we got introduced to two characters. Fuchiya Shinnosuke, a classmate of Asumi since childhood. He often makes comments about Asumi’s mistakes as seen through flashbacks. Then we have Shu Suzuki, a laid back kind of guy who commented on Asumi’s appearance of being fragile. To minimize the number of applicants, they were put to another sort of test. They were put into group of three and forced to live in a closed room for about a week. 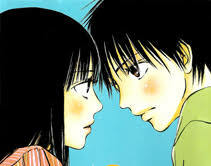 Asumi’s group consisted of an unfriendly loner girl, named Marika and the sociable Kei whom Asumi fastly befriended. Their test was to determine their cooperativeness and perseverance. It was a rather boring task, to stacked up all the domino pieces by the end of seven days. It might seem easy but it did get tiresome. Throw in an obstacle on top of that and you get frustration out of them. At the end though, Asumi’s group managed to pull it off. It was also explained in this volume about the title. Spica is the name of Asumi’s favourite star. It’s a binary/double star, one of the brightly shining star at night. By the end of the main story, we’ve got two short stories. This contains flashbacks of Asumi’s mother and the tragic cause of her death. The story about the phantom Lion-man character and his first encounter of Asumi. We learned that Mr. Lion was the former lover of Asumi’s teacher, Suzunari Yuko, who died as one of the pilot of the first ever Japanese rocket. Asumi almost drowned in the last story which led her to meet her mom. I like the part where she helped her mom cross the path of eternal life. It’s full of emotion since this was the only time she saw her mom’s face. We also got to see Fuchiya as Asumi’s savior. The first volume of Twin Spica is very much sentimental and nostalgic. Highly Recommended.